Coming in to the Championship 5000 Meters, Fort Worth Christian's (TX) Carter Cheeseman was considered the heavy favorite. Cheeseman qualified for both national championship cross country meets this fall, finished 10th at the Foot Locker Championships in San Diego, brought home another TAPPS State Championship in Texas, and ran 14:50.70 for the win at the Great American Cross Country Festival. "The Cheese" has had a quiet indoor season, highlighted by a 4:12.85 full mile at the Millrose Games in February. 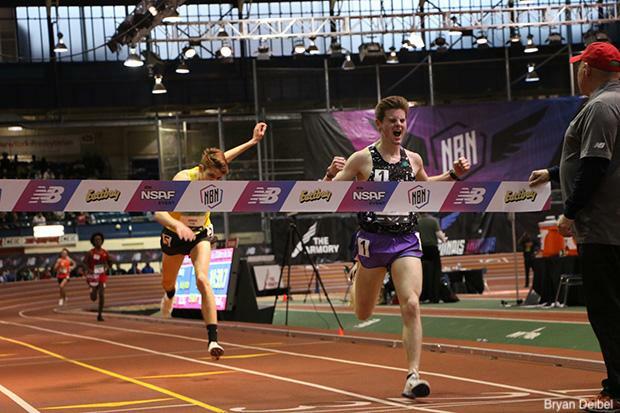 This Friday he returned the Armory for three times that distance and was able to dispatch his challengers for the 14:40.01 victory, edging out Michigan standout Corey Gorgas at the line. It was the first national title for Cheeseman, but not his first go-around on the track at the distance. Last spring, he again sat and kicked to a win under the lights at the Texas Distance Festival, running 14:36.60 there. While it would be a quick turnaround for him at the 5K distance, we could see Cheeseman again go for a victory there in just a few weeks. Gorgas, though he was edged out in this one, still came across in a blistering fast 14:40.75, well ahead of the 15:10.70 personal best that earned him ninth at this fall's Foot Locker Nationals. Also coming in under 15:00 were Burnt Hills-Ballston Lake (NY)'s Tyler Berg (14:52.23), Shelby (OH)'s Caleb Brown (14:53.59), and Millbrook (NC)'s Nick Scudder (14:55.08).